A new book has been published by the Boston College Presidential Scholars Class of 2016 that examines what makes Boston Strong – and what is needed to make it stronger. 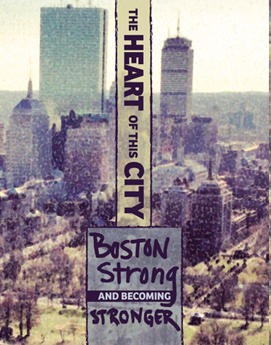 The Heart of This City: Boston Strong and Becoming Stronger features interviews with victims of and witnesses to the bombings, as well as with people connected to Boston-based social services agencies, who all reflect on the Boston Strong message. The book opens with a letter from Boston Mayor (and BC alumnus) Marty Walsh and includes reflections on the marathon bombings, as well as sections on homelessness, health inequity, immigration and educational disparity in Boston. A number of BC faculty members also contributed to the book. For the Presidential Scholars, the message of The Heart of This City is simple: “We are members of the same city and we need to take care of one another.” More from the Boston College Chronicle. This entry was posted in Boston College Authors, Students and tagged Boston, Boston Marathon, homelessness, Presidential Scholars, social justice. Bookmark the permalink.